Other branches of the clan: O’Kennedy, Keenedy, Kenedie, Kenady, Kenedy. Irish Clan Name: Ó Cinnèide, also Minnagh used in the Connacht County of Leitrim, (from Muimhneach meaning “man from Munster”). A black shield holding three helmets, two at the top of the shield and one at the base. The helmets are in their natural (proper) colour, and half-turned “in profile” to the left of the shield, as viewed from the front. A bent right arm, wearing a blue (azure) sleeve, the fist in natural (flesh) colour, holding aloft a scimitar (a Moorish sword with a curved blade) in its natural (proper) colour (silver metal). Kennedy is the sixteenth most commonly-found name in Ireland. The Irish name Ó CINNÉIDE comes from the Gaelic ceann meaning “head”, and éidigh meaning “ugly”, hence possibly the pun and gentle joke in the Kennedy Arms of “hidden heads” encased in masks of steel! 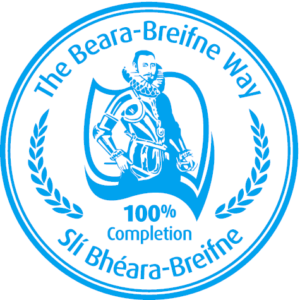 The founder of the Clan was Cinnéide, a nephew of Brian Boru. Brian became High King of Ireland in 1002 and was killed defeating the Danes at the Battle of Clontarf, County Dublin, in 1014. His father was Cinnéide, King of Thomond. This family are an important Dalcassian Sept originating in what is now Eastern County Clare; in the ancient Territory of Thomond, occupied by a people formerly known as the Dál gCais (hence the name of their race). They resided in the areas around Glenomra and Killaloe in County Clare. An area in that region is still called Killokennedy (“Kennedy’s church” or “wood”). From Clare, some Kennedy’s moved to North County Tipperary and then spread from there as far south as County Wexford. Some went from Ireland to Scotland where they gave rise to the Scots Kennedys. Those bearing the family name in Ulster may be descended from Irish or Scots Kennedys. A smaller and less powerful Sept than those of the Ormond Kennedys was that of the Úi Máine Kennedys of Connacht Province (Anglicised to Hy Many, and indicating a population group found in the present areas of County Roscommon and mid-County Galway). After defeats at the hands of the O’Brien and MacNamara Clans, the Kennedys were forced from their Clare homelands eastwards across the River Shannon into the Baronies of Upper and Lower Ormond in North County Tipperary. Here they soon prospered and became Lords of Ormond from the eleventh to the sixteenth centuries, as recorded in The Annals of The Four Masters. There is a place called Garrykennedy in Upper Ormond (“garden of Kennedy”), and another called Coolkennedy (Kennedy’s “nook” or “corner”). In 1159 the Chief of the Kennedy Clan was referred to as “Lord of Ormond” and the family were mentioned as being a “nation” of importance in an Ormond deed of 1336. Three main branches of the Sept developed, named for their hair colouring – O’Kennedy Finn (fionn “fair”), O’Kennedy Donn (donn, “brown”) and O’Kennedy Roe (ruadh or rua, “red”). The History of the Ormond Kennedys may be read in the book “The Last Lords of Ormond” by D.F. Gleeson. Some Kennedys still held some influence in the Territory of Thomond; Donal O’Kennedy was Bishop of Killaloe from 1231 to 1252. The Kennedys spread eastwards from Ormond across to the Irish coastal counties and by 1659 the name was recorded for 36 families in the Baronies around the City of Waterford. There is a place called Ballykennedy (“home of the Kennedy’s”) in South County Waterford. The nearby area around Dunganstown and Stokestown, on the East side of estuary of the River Barrow in County Wexford, is the area where the family of U.S. President John Fitzgerald Kennedy originated. His great-grandfather, Patrick, (son of James Kennedy and Maria Handrick), was baptised there on 18 October 1829 and went to America in 1848. The John Kennedy Memorial Park is in South County Wexford. Several Kennedys were officers in the Jacobite Army of King James Stuart II. They fought at the Battle of the Boyne in 1690 during his campaign to regain the throne of England from the Dutch King William of Orange. After William had defeated the Jacobites, 17 Kennedy’s were outlawed and their lands seized because of their Catholicism and loyalty to James. They were forced to flee to the Continent of Europe, together with many other officers and noblemen, to seek better fortunes there. These exiles became known as “The Wild Geese”. Many did indeed find their fortunes in Europe, serving in the armies and diplomatic corps of European Monarchs, and being granted lands and titles as a result. In Spain, the name Kennedy became Quenedy. Other Kennedys refused to leave their homeland, and those who would not work for the new landlords were forced into brigandry to survive. Daniel Kennedy was beheaded in May 1657 and his head set onto a pike over the gate of Carlow Castle as a warning to others who might take to a life of crime. Some Kennedys managed to avoid both land forfeiture and banishment. Burgh’s “Landowners of Ireland” of 1878, listing all landlords then in possession of considerable lands, shows 19 Kennedys as such landlords. Nearly all of these are in areas away from the original seats of the Kennedys, and any of the family remaining in their original areas had to content themselves with serving those who had been granted their confiscated lands. Matthew Kennedy (1652-1735) went to France after the capitulation of Limerick in 1691, and became a notable literary figure in France, famous for his championing of his native Irish tongue. The Kennedys held to their Catholic faith and an Order signed by the Lord Lieutenant of Ireland on 30 March 1705, granted the right to bear arms to eight Papist gentlemen of County Tipperary, amongst then John Kennedy of Polnorman. In 1779 two Miss Kennedy’s of County Waterford were abducted and their case made sensational news throughout the country. Some fortune-hunting young men had obviously hit upon the abduction of these daughters of a wealthy family as the answer to their financial problems! Patrick Kennedy (1801-1873) was the author of works on Celtic Legends and Gaelic Folklore. He had a small bookshop and lending library on Anglesea Street, Dublin. Another writer was Patrick John Kennedy (1843-1906) the well-known Irish-American Catholic publisher. Of famous ecclesiastical Kennedys, the Reverend James Kennedy was a classical scholar and a Fellow of Trinity College, Dublin. He was Rector of Ardtrea, County Tyrone and died there. The Reverend John Kennedy (1724-1730) was a Presbyterian Minister in Ulster and kept extensive diaries of his life and duties there. Sir Arthur Kennedy (1810-1883) was from Cultra, County Down and also graduated from Trinity College. He retired from the Army in 1848, subsequently becoming a Poor Law Inspector at the time of The Great Famine. In 1851 he became a Colonial Governor in The Gambia, West Africa, and then went to Australia. He was granted a Knighthood in 1868, and afterwards became Governor of Hong Kong and then Governor of Queensland, Australia. Hugh Kennedy (1879-1936) was the first Chief Justice of the Irish Free State. Every Kennedy was also born in the 1800’s, at Carndonagh, County Derry. He studied medicine in Dublin, London & Edinburgh, subsequently becoming Master of The Rotunda Hospital in Dublin – the second oldest maternity hospital in the world. In 1833 he became President of the Dublin College of Surgeons. He went into politics unsuccessfully, in Donegal, and he died in London. Patrick J. (“P.J.”) Kennedy, (1862-1929) son of the Patrick Kennedy who emigrated to U.S.A. from Waterford in 1848 was a politician who had made his money in the saloon and banking business. Through his political activities, “P.J.” became acquainted with John F. (“Honey Fitz”) Fitzgerald, Mayor of Boston, Massachusetts. “P.J.”s son Joseph P. Kennedy, a financier and politician, eventually became the United State’s Ambassador to Britain during the 1940’s. He married John F. Fitzgerald’s daughter Rose who became the matriarch of America’s leading family. She and Joseph “Joe” Kennedy intended that their first son Joe Junior would become President of the United States, but he was killed on active service as a pilot in 1944 during World War II. His younger brother then carried on the family’s ambitions, and became Senator for Massachusetts and then the first Catholic President of the United States. Following his assassination in 1963, his younger brother Attorney General Robert “Bobby” Kennedy campaigned for the Presidency, but was also assassinated. Another brother Edward “Teddy” Kennedy was left to carry on the family traditions in American politics.